Houxo Que : I have watched all the three masterpieces and feel that they all take an important part of creating the Japanese culture we have today. Houxo Que : I would say that it still has an impact on the material I create today. To this day,I still think about how the puppet master questioned the existence of life and an information-based society. Houxo Que : A timeless piece of history. Houxo Que : Because the use of internet is growing so fast, I think it is fair to say that there is some kind of change in the flow structure and how we store our information on a daily basis. The information we receive is all stored in some sort of an external memory format. Like, I can’t even remember what tweet I liked yesterday or what post I reposted you know? I think this happens because we store all our memories in our own account so there is no reason to remember it within our own selves in real life. I think these kinds of changes of how we link and store our memories will continue to change how we perceive our culture just like how the plates of lands continue to move. I think we should not ignore the fact that especially internet services like YouTube that are even targeting children under six years will continue to grow further in the coming years. My oldest is currently three years old right now and he learned the alphabet just so he can search videos on YouTube. So this is why this phenomenon is very interesting to me. But all of this might just be a part of the structure of how old media is transitioning to new media over the years. When looking at the internet, you easily see old information and new information, regardless of the context and time frame in the same platform. In music, you see new releases and songs released twenty years ago all in one playlist. So in this kind of time, it's easy to lose the background story of each information and be pulled back by it, so I would say from now on an alternate way of personal consumption must be created to meet the new generations’ standards. I myself am a true artist, so I am particularly interested in how people perceive and live with their own minds with an external platform in this kind of day. I think that some sort of a “display” format and the technology that comes with that concept is the key to this new generation, which all is something I am personally researching right now. But, I think it is possible that in the next twenty years, fifty years or even three hundred years of time a different kind of era and generation would take over our world. Encountering graffiti in his teens, QUE began his artistic activities mainly on the street walls. From then on, he has been known for his fluorescent paintings and installations using black lights. He has also presented his creative process as live painting shows many times. 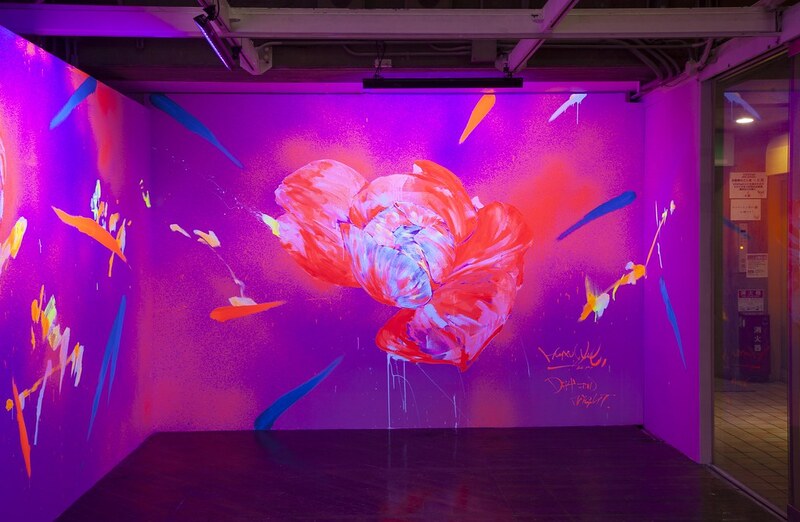 From 2012, he started painting directly onto displays that were presented in “16,777,216views” at BCTION (2014) and Gallery OUT of PLACE (2015). Through these exhibitions, QUE has been gathering wide attention in the contemporary art scene.